Cathay PacificTwo Cathay Pacific flight attendants in the airline’s business class cabin. Cathay Pacific has scrapped a 71-year old uniform rule that forced female flight attendants to wear skirts. The policy change comes after years of pressure and complaints from female flight attendants who claim their uniforms are too revealing. The airline may require as much as three years to create revamped uniforms with non-skirt options. 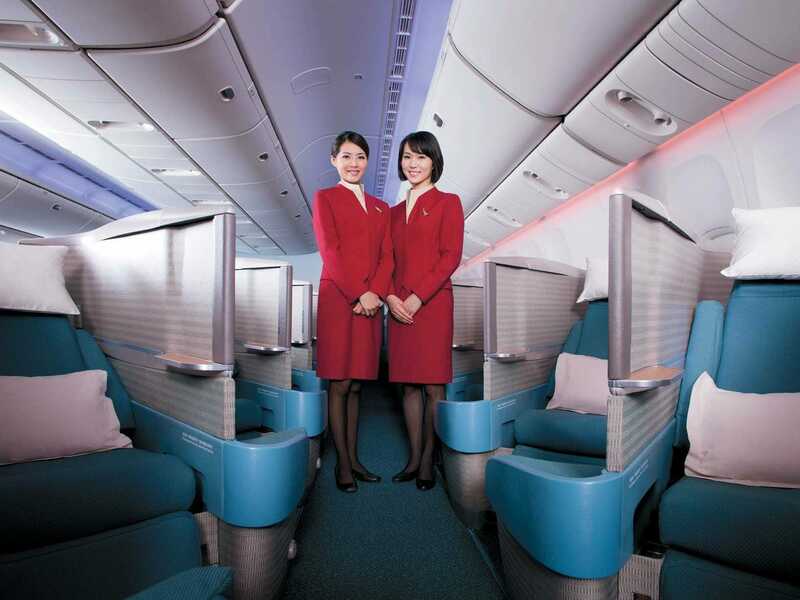 Female flight attendants at Cathay Pacific are now allowed to wear pants at work. The Hong Kong-based airline abolished its 71-year-old, skirts-only uniform policy after considerable pressure from its female flight attendants and their unions, the South China Morning Post reported. The new uniform rule is expected to cover both Cathay Pacific and regional subsidiary, Cathay Dragon Airlines. The current Cathay Pacific uniforms by designer Eddie Lau were introduced with great fanfare in 2011. However, female flight attendants have complained that the skirts and blouses are too short, too tight, and too revealing. As a result, Cathay’s flight attendants and their union claim the uniforms have made it more difficult for the crew members to do their jobs while contributing to a rise in reported sexual harassment. The new uniform policy “not only provides us one more option, but also provides us with protection,” Pauline Mak, vice chair of the Hong Kong Dragon Airlines Flight Attendants Association, told the BBC. According to the SCMP, roughly 2,500 of Cathay Pacific’s 7,000 female flight attendants have indicated they were in favour of wearing pants. However, it is unlikely you’ll see Cathay Pacific’s female cabin crew in pants anytime in the near future. Since there aren’t any non-skirt options in the airline’s current uniform package, it may have to wait for its next uniform revamp to include the necessary pieces. This could take as long as three years. But, union leaders are said to be pushing for pants to be added in the interim.